It’s time to reevaluate your fitness regimen. Train hard and get fit with the benefits of adding self defense to your skill set at Sanshinkan Martial Arts. Mixed martial arts is not just another fitness trend, it’s here to stay. 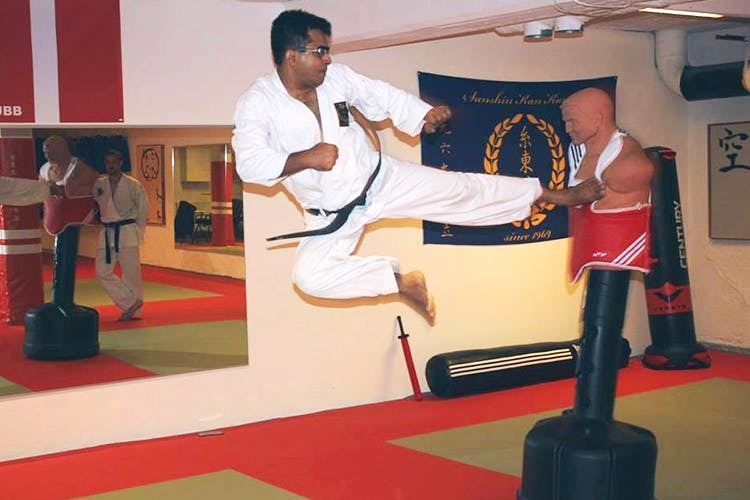 It’s important to get the techniques down perfectly so that you don’t injure yourself or others, so we’re really glad to see that Sanshinkan has certified trainers and is recognised by the Karate Association of India as well as the Ministry of Sports and Youth affairs. When you opt for mixed martial arts you get to learn almost every sort of self defense and fighting technique there is, disciplines like Karate, Kung Fu, Muay Thai, Jiu-Jitsu, Judo and our personal favourite – kickboxing. There was never a more important time for women to learn self defense than now. We can get familiar with techniques and the points vital to safeguarding ourselves if ever the need arises. At Sanshinkan there are special, women only self-defense classes, which we highly recommend. Sanshinkan also has training programmes for those looking to join the armed forces. They’ve assisted police, special forces and paramilitary forces, so rest assured you’re being trained by the best in the business. These classes are great for anyone who wants to build their strength, along with working on their reflexes and getting some major self-defense pointers.